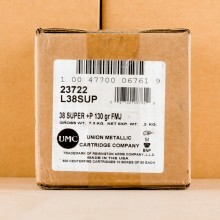 Originally manufactured by Colt for use in the M1911 pistol, 38 super ammo is loaded to a higher pressure than 38 Auto. 38 Super is a caliber known for extremely fast muzzle velocities and is very popular and respected for its performance by a large contingent of competitive shooters in IPSC and USPSA. Colt introduced the 38 Super cartridge in the late 1920’s as a round that was capable of penetrating body armor and some vehicles at the time. At this point in history, the mobster/gangster movement was very prevalent in places like the streets of Chicago so a handgun round that was capable of penetrating some of the first bullet proof vests was vital to the success of law enforcement agencies. Evolved from the 38 ACP cartridge, the 38 Super has the same dimensions as its parent case, with a bullet diameter of .356-inches. 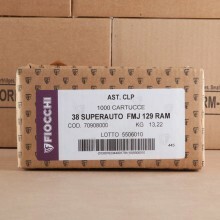 Today, you’ll find 38 Super ammo with a +P on the headstamp, alerting you to the fact that this ammunition is loaded to higher pressure than the traditional 38 ACP round. Because of a relatively large case, you can stuff more smokeless powder in a 38 super round than many other handgun rounds. This offers faster bullets. 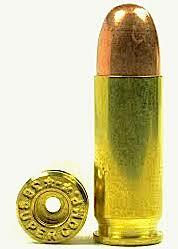 The lightest round generally available in 38 Super, 90 grain, can travel nearly 1,600 feet per second from a 5-inch barrel. 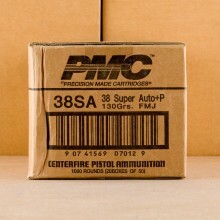 Heavier bullets in the 150 grain range are also manufactured commercially. 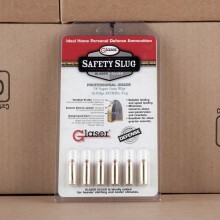 These rounds travel slower at about 1,150 feet per second, bringing muzzle energy of about 440 foot-pounds to the table. 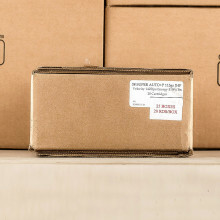 Like most pistol ammunition, you’ll likely want to look for jacketed hollow point (JHP) bullets for sale if you’re looking for 38 Super defense ammunition. For range use, a full metal jacket (FMJ) projectile should suit you just fine. 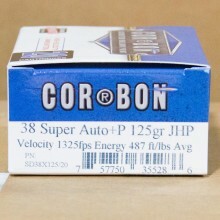 Incredibly popular among competitive shooters, look for 38 super ammo in-stock by top manufacturers like Armscor, Federal, and PMC.